Stayfree pads, Carefree liners & OB Tampons just 50Â¢ or 75Â¢ at Rite Aid this week! Rite Aid hasÂ OB tampons,Â StayFree Maxi Pads, andÂ CareFree linersÂ on sale for just 2/$5, and if you buy any 2 of them, you get $2 back in UP+ Rewards.Â Combine that with these coupons and get them for as little as 50Â¢ each!Â Â Use zipÂ 84070Â if you need it.Â And remember – you can print them twice!! StayFree Maxi pads:Â 2/$5 on sale, -$2 up, -(2)Â $1 couponsÂ = 50Â¢ each! OB Tampons:Â 2/$5 on sale, -$2 up, -(2)Â 75Â¢ couponsÂ = 75Â¢ each! Carefree Liners:Â 2/$5 on sale, -$2 up, -(2)Â 50Â¢Â couponsÂ = 75Â¢ each! Rite Aid has OB tampons, StayFree Maxi Pads, and CareFree liners on sale for just 2/$5, and if you buy any 2 of them, you get $2 back in UP+ Rewards.Â Combine that with these coupons and get them for as little as 50Â¢ each!Â Â Use zip 84070 if you need it.Â And remember – you can print them twice!! StayFree Maxi pads:Â 2/$5 on sale, -$2 up, -(2) $1 couponsÂ = 50Â¢ each! OB Tampons:Â 2/$5 on sale, -$2 up, -(2) 75Â¢ couponsÂ = 75Â¢ each! Carefree Liners:Â 2/$5 on sale, -$2 up, -(2) 50Â¢ couponsÂ = 75Â¢ each! Rite Aid has OB tampons, StayFree Maxi Pads, and CareFree liners on sale for just 2/$5, and if you buy any 2 of them, you get $2 back in UP+ Rewards.Â Combine that with these coupons and get them for as little as 50Â¢ each!Â These coupons below are NOT expired, I don’t know why they are showing that way here, but click on them and print them – they are still valid!Â Use zip 84070 if you need it.Â And remember – you can print them twice!! StayFree Maxi pads:Â 2/$5 on sale, -$2 up, -(2) $1 coupons below = 50Â¢ each! OB Tampons:Â 2/$5 on sale, -$2 up, -(2) 75Â¢ coupons below = 75Â¢ each! Carefree Liners:Â 2/$5 on sale, -$2 up, -(2) 50Â¢ coupons below = 75Â¢ each! O.B. Tampons just 75Â¢ at Rite Aid next week! = $1.50/2 or 75Â¢ ea!!! Limit is 4 +UP rewards so if you have more than 1 computer it is a great time to stock up!!! Lysol No-Touch Kitchen System for 99Â¢ or FREE with coupons & rebate from All You Magazine! If you got your April issue of All You Magazine in the mail,Â you have probably seen that there is a $3 mail-in rebate for the Lysol No-Touch Kitchen Starter Kit on page 100. Use this rebate to snag a great deal on the Lysol No Touch Kitchen System at both Rite Aid and Target this week. 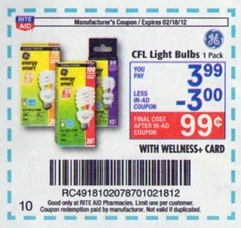 Print this coupon and save it for Rite Aid the week of 3/18 to score some free Reach toothbrushes! = FREE after UP Rewards & Coupon!